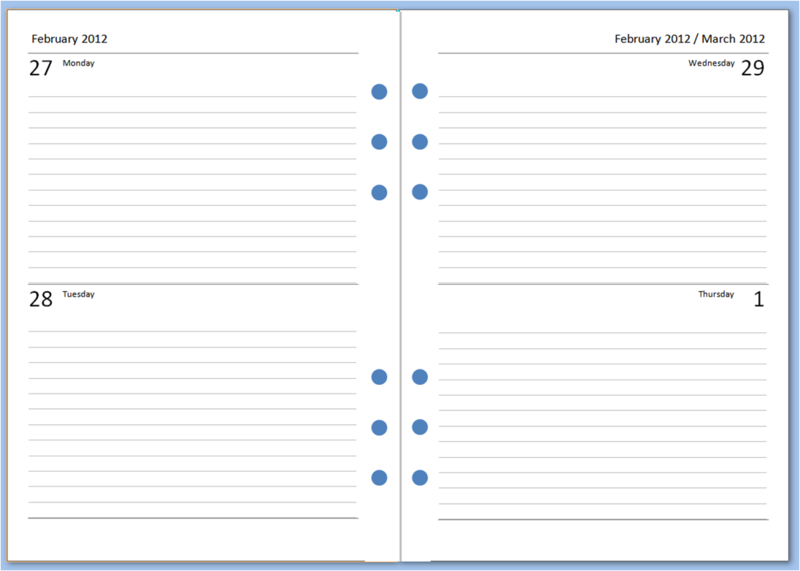 Hopefully you've found one of the new diary layouts that you like. But perhaps it's not quite exactly what you want. Perhaps you'd like the lines to be pink rather than grey, the dates to appear in Comic Sans font. 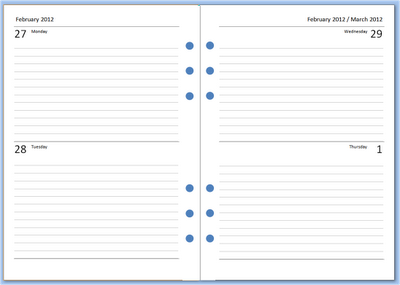 Or perhaps you'd like to produce a diary now for 2013, 2014 or 2525. 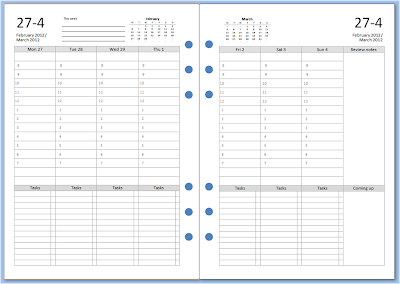 Maybe you want to print a diary for a particular period rather than a calendar year all in one go. If that describes you, you're in luck. 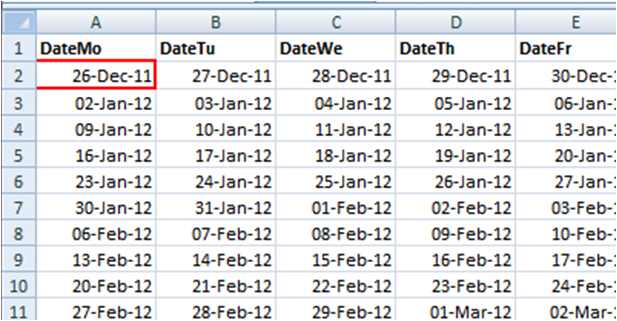 If you want fewer dates, delete full rows at the bottom end. If you want more, drag the formulae down into more rows. If you mess up, you can always download the file again and start over. Depending on what version of Word you're using, Word may put section breaks between every record, which will throw out the mirrored gutter formatting in the layout. If it does, the solution is quite simple; do a find and replace on section breaks (^b) to remove them all. You'll also need to add a single page break to the front of the merged document so that each 2-page spread has gutters in the middle for the holes. Now, if you just read all that and understood at least some of it, get downloading and have a go. However, if it might as well have been Venusian, then you might be better off just downloading the pre-prepared 2012 sets. Here are the source files. 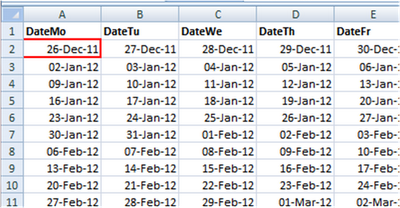 Download Word file (unlined), Word file (lined) and Excel file (same one works for both versions). Have fun, and please share in the comments any interesting modifications you make. I really do like your many creations! There are some which I would like to use in my organizer, too. But I´m using the Pocket size. Will it be possible for you to create these fantastic layouts for the Pocket size also? 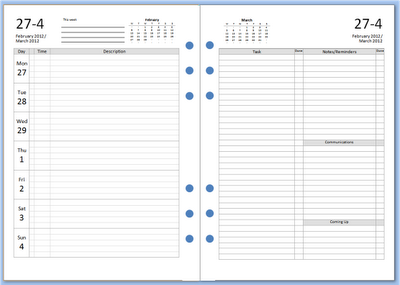 I've never made a Pocket size insert, probably because I don't use a Pocket Filofax. I'll see if I can get hold of one. Watch this space. @Renate: email me (ray DOT blake AT gmail DOT com) and I'll send you a couple of Pocket-sized layouts to try. 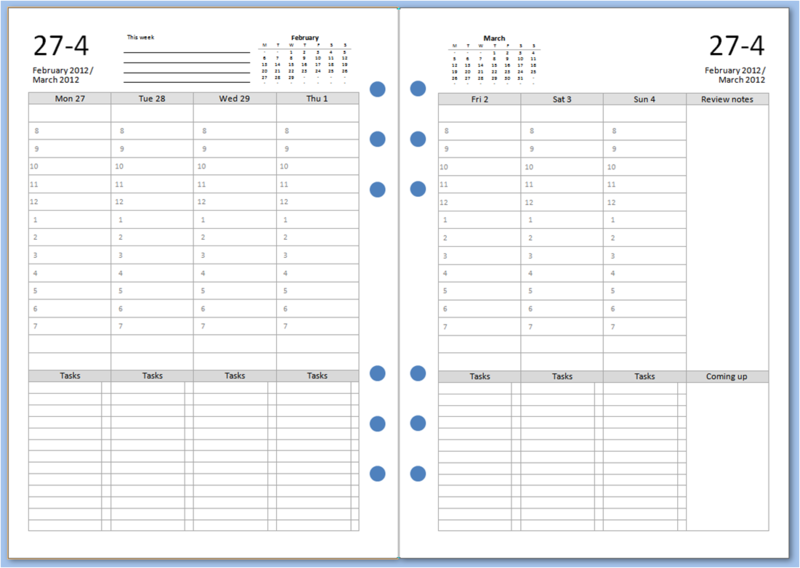 The furthest I got was doing the templates and writing the dates in by hand! At the moment I am not using my A5 filofax. For work purpose having all Monday to Sunday on a side of A5 was not enough space. 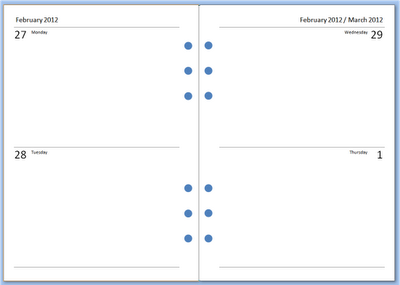 So this year I (by hand) made my own A4 diary - to maximum the Mon-Fri space I put Sat/Sun on the right. 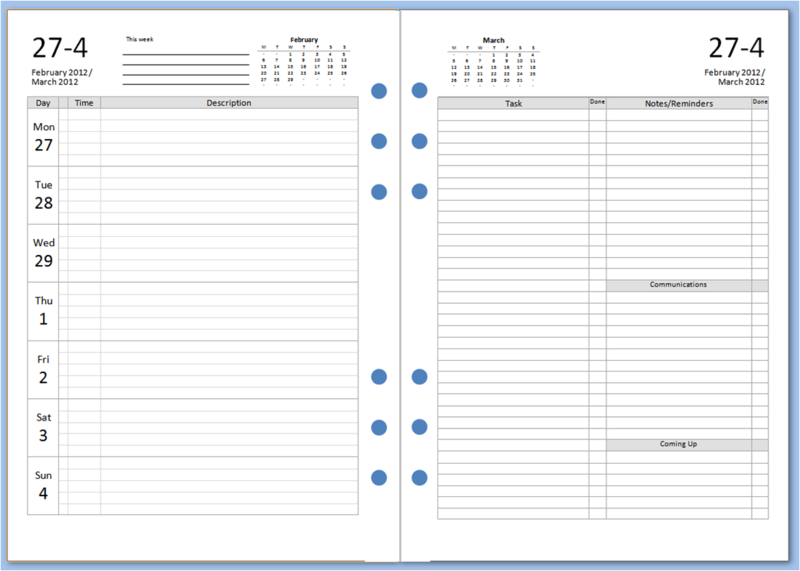 But an A4 one is a bit too heavy..
Is your word doc like a template I can play around with? 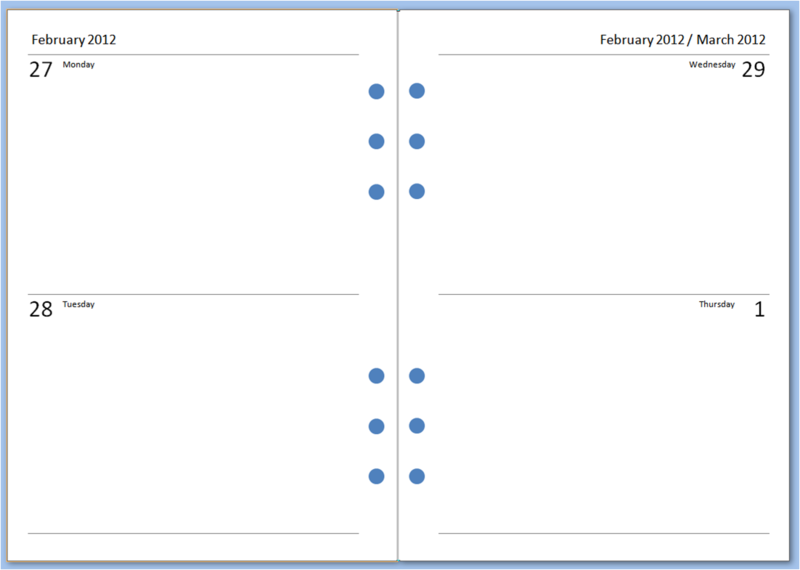 I would love to experiment with having A5, Mon-Fri on left and Sat/Sun and to-do list on the right. Yes, the templates are fully editable. Have fun!